The Industry 4.0 revolution is enabling new levels of automation, including a new generation of sensors-rich automated guided vehicles (AGVs) for use in the first wave of smart manufacturing and distribution facilities. This revolution also requires new ways of thinking across all aspects of materials handling, especially when it comes to functional safety and reducing accidents in the workplace, and in turn, presenting a new challenge to sensing and control manufacturers. Hand-in-hand with the navigation and steering technologies comes a wide range of sensors that provide critical feedback to the control system about the AGV’s surroundings and operation. The sensors used to navigate, like LiDAR and cameras, and those used to control ground speed and direction, like encoders, are critical to ensure precise and safe operation. 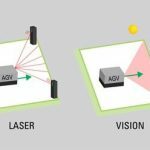 One of the most recent innovations in AGV design is the use and application of LiDAR technology. Similar to radar, LiDAR instead uses laser beams of light bouncing off the environment to accurately measure object range and 3D shape while also providing intensity data that helps detect things like lane markings. Whereas camera-based solutions, for example, can sometimes struggle in environments that are prone to sudden vibration, low light or dust, LiDAR systems prove to be more reliable. Compared to other navigation approaches, they do not require external targets such as reflectors, RFID, or markers for navigation. As such, they are ideally suited not only for localization and mapping, but also to help prevent collisions and ensure loads are properly and safely engaged and placed. Traditionally, LiDAR sensors have been costly and based on a mechanical scanning design. LiDAR technology is moving forward however, and new, entirely solid-state solutions (i.e. they have no moving parts) require less power and deliver higher resolution at a longer range. Not only is this new generation of LiDAR sensors more reliable than mechanical models, it is also more affordable. By mounting several small solid-state LiDAR sensors in an array, a live 3D surround view is created that can detect and track stationary and moving objects as required. A perfect fit for applications relying on natural navigation (and a technology that includes both vision and laser-guided components), the latest LiDAR solutions offer the highest resolution with the maximum amount of system flexibility. Areas of interest and scan patterns can be configured as needed and the compact, modular design allows for the integration of third-party performance processing hardware and software. To control ground speed and direction in response to the data coming from the navigation technology in a broad range of AGVs, highly precise and safety-rated encoders are often used. To minimize or eliminate risk to machinery and systems in industrial applications, components such as encoders can be certified to industry standards of performance and safety levels. For AGV applications, components that are rated up to Safety Integrity Level 3, or SIL3, are ideal, as this allows for the highest safety level in the system. SIL3-rated encoders can often be more expensive than those of a lower safety rating, but they greatly reduce the risk of failure to the system, which in the case of an AGV navigating a warehouse, could prevent costly damage or injury. Using encoders of a lower rating, like SIL2 or less, often means that additional encoders may be required for redundancy in order to achieve an acceptable level of risk for a given application. The need for extra components adds complexity and cost to the system, and can be a serious issue in the space-restricted design of automated/autonomous vehicles. The aforementioned sensors and functions are used broadly across the entire range of AGVs applications. If we focus on fork lift truck and pallet lift truck AGVs specifically, then several other sensors also need to be considered. In these applications, additional encoders and position sensors are required to ensure safe and controlled operation. The mast height (or fork height) control could be considered for driven lift trucks but it becomes essential in lift truck AGVs. Controlling the mast or fork height in a lift truck is crucial for proper load positioning as goods must be safely removed or stored at varying heights and to prevent collisions with overhead items. Also known in the industry as cable transducers, string potentiometers, linear position string pots, and string encoders, draw wire sensors are used to provide precise linear position feedback of the mast. These components utilize a flexible cable, a spring-loaded spool, and a sensor (an optical encoder with incremental, absolute, analog or potentiometric output or, in some cases, a hall effect sensor) and are ideal for wet, dirty, or outdoor environments. This type of position sensor can also be used in AGVs to monitor lateral fork movements for automatic pre-setting to various pallet sizes. Rotary hall effect sensors are used in AGVs for different functions like the fork tilt control in lift truck AGVs (and lift trucks in general). Positioned at the bottom of the mast, this sensor provides the functionality to calibrate and control the inclination of the fork and prevent the load from being spilled. In addition, electric-driven scissor lift tables can be integrated into the AGV’s in order to raise and lower a static fixture onto the vehicle for transport, or to position the product for human interface. In these cases, a rotary hall effect sensor is used to measure the inclination of the lateral scissors and then regulate the fixture to the desired height. There are other sensors used in AGVs: pressure sensors are used to control the load weight in fork lifts, and load cells can be used for the same function in unit load carriers; in magnetic navigation systems, specific sensors for track guidance along magnetic tape are used. The magnetic sensor measures how far from the center of the tape it is and provides the information to the motor controller, which will then adjust the steering so the vehicle remains at the center of the track. AGVs guided by inertial navigation use transponders to verify that the vehicle is on course, and a gyroscope to detect the slightest change in the direction of the vehicle. 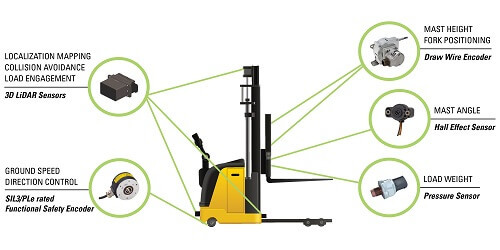 In lift truck applications, in order to prevent the AGVs from colliding and to safely load and unload pallet materials, compact photoelectronic sensors are integrated into the narrow fork cone ends as well as the metal chassis. The materials handling sector is one of the most important to designers, manufacturers, and engineers working with sensing and control technologies, and the rise and rise of Automated Guided Vehicles is accelerating the development of new and even more sophisticated sensing solutions. The increasing interaction between man and machine means that the watchword in materials handling remains "safety", and this in turn means that sensors and controls manufacturers are continuing to raise the bar in innovation and excellence, while at the same time reducing cost and size. 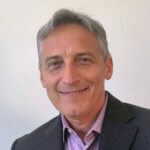 Today’s emerging sensing technologies are fast becoming the standard product of tomorrow, as materials handling equipment designers, manufacturers, and operators seek greater efficiencies, better performance, and the highest possible levels of safety.